Products made of metal or containing metal parts have the risk of corrosion during shipping or storage. Corrosion is a series of complex chemical reactions due to the effect of oxygen, water, or salt on metal. Therefore corrosion protection measures should be taken for metal materials. Traditional methods for corrosion protection is painting or coating with oil or grease on the surface of metal to prevent from air. However this can be costly because it is time ineffective to do painting or coating. Then the oil and grease must be removed before the products can be used. In addition, painting may not be suitable for some metal parts that will be installed into other products. Boxon has extensive experience of corrosion protection packaging. Our corrosion protection solutions save you time and labor and have already been used by a large number of customers. VCI is short for Volatile Corrosion Inhibitor. It is added to packaging materials and can vaporize in the air and creates a barrier layer that prevents from corrosion elements around the surface of metal. It is a highly effective packaging against corrosion and cost-efficient compared with traditional painting or coating. INTERCEPT technology™ is different from other passive protection methods. This kind of material proactively reacts with corrosive elements in the air and protect from corrosion. It consists of copper particles that are chemically and permanently bonded to the structure of the packaging material. The copper particles easily react with corrosive elements in the air and keep the inside air neutralized. It is used in combination with desiccants. INTERCEPT can protect metal products from severe corrosive conditions for long duration. Sensitive electronics and flammable gases or liquids must be protected against static electricity to avoid electrostatic discharge (ESD) that may damage your goods and cause fire or explosions. An important part of ESD protection is to use the right protective packaging. Boxon offers a comprehensive packaging solution for ESD protection. 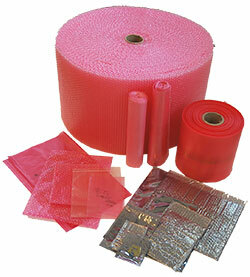 This includes packaging materials for conducting, dissipating, shielding or insulating electric charges. The offer also includes packaging training and instructions relative to ESD protection.